1. Your lower body is way stronger than your upper body. Therefore, it requires a lot more intensity from what a basic bodyweight exercise can offer in order to be stimulated enough to grow stronger and bigger. 2. It’s main functional purpose from an athletic standpoint is to allow you to jump higher and run faster. 3. By adding a jump at the end of each rep, simple bodyweight exercises can become a lot more challenging. 4. Plyometrics and high intensity running generate increased metabolic stress and fast-twitch muscle fiber recruitment, resulting in muscular adaptations similar to those obtained from lifting weights. 5. This doesn’t mean that plyometrics and sprints are as optimal as heavy barbell squats for stimulating hypertrophy in the lower body. But, using them strategically in your weekly routine can definitely build strong, defined and muscular legs (a lot more efficiently from basic bodyweight exercises). 6. Another cool bonus of this type of training is increase core activation. Just like all challenging bodyweight exercises, sprints and plyometric challenge your abs as well. 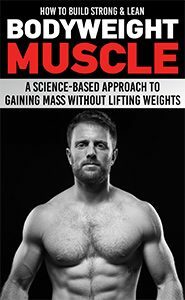 During my journey of building muscle with bodyweight exercise, lower-body training was one of the topics that puzzled me the most. 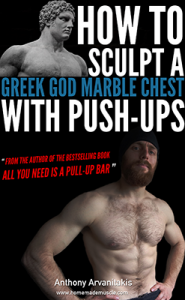 When it came to the upper body, I found that there were enough challenging exercises you can take advantage of in order to build muscle. But, for the lower body, even though there are again a variety typical exercises to do (i.e. bodyweight squats, lunges, Skater Squats, Bulgarian squats, etc), I found that none of these added any significant muscle mass to the lower body once you move passed your beginner gains. Sure, you can add extra weight such as sand bags (as I’ve done in the past) and make these exercises more challenging. The only problem then is that you’re not really doing bodyweight exercises anymore. Keeping your training routine as equipment-free as possible and giving yourself the freedom to pack a simple backpack and train almost anywhere and anytime is the core philosophy of this project. WHAT ABOUT PISTOL SQUATS: Some will say that you can also do pistol squats since they’re often promoted as the ultimate bodyweight exercise for training legs. I have to be honest though and tell you that I’m not a big fan of this particular exercise anymore for a couple of reasons. For example, unless you have extreme ankle mobility it’s very difficult to perform a pistol without rounding the back (lumbar flexion). Several misalignments occur in the ankle and knee joint as well (such as excessive pronation and valgus collapse). These often can cause or increase knee and back pain for people that are prone to these issues. Look, I’m not saying that the pistol should be a forbidden for everyone. But if you have knee and back issues, I highly recommend you avoid it. You can check this article for more details on why I do not advocate the pistol anymore. Finally, I realized that the best way to stimulate your legs for muscle growth using strictly bodyweight-exercise training doesn’t require anything that complicated. You just have to train them to perform the way they were meant to perform. 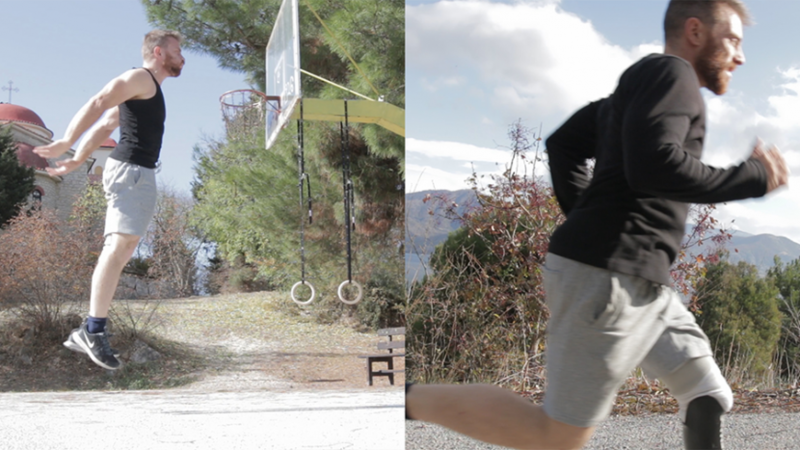 And the best way to that is through high intensity running and plyometrics (aka jumping exercises in plain words). If you simplify your anatomy a bit, you can say that your muscles are made up of fast and slow twitch fibers. The fast-twitch ones are your largest and strongest fibers, also playing the biggest role when it comes to hypertrophy. They are stimulated through heavy lifting, high intensity anaerobic efforts and explosive movements such as plyometrics. 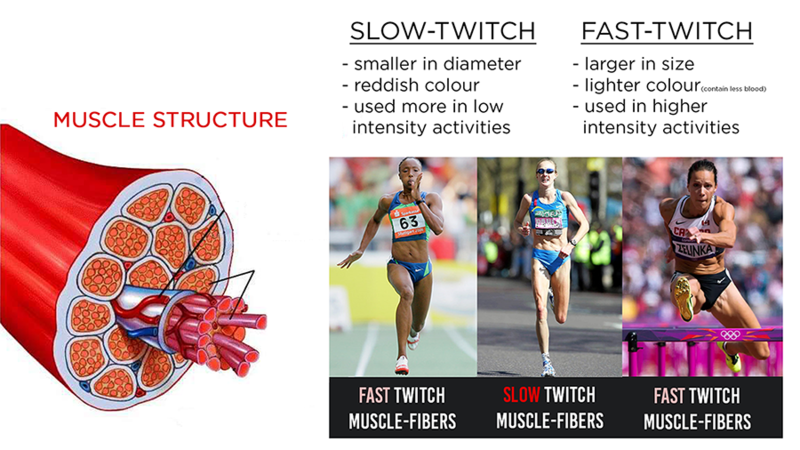 Slow-twitch fibers on the other hand, play a bigger role in endurance oriented efforts. 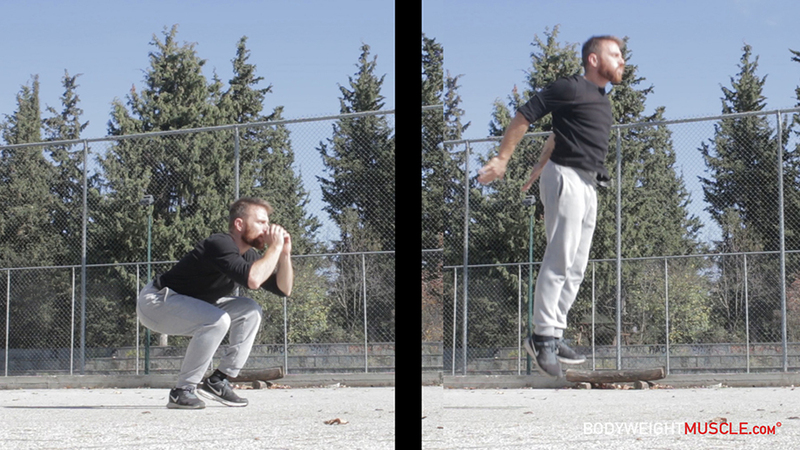 Plyometrics are also called jump-training if you prefer a more simple and self-explanatory term. Their main advantage is that they force your muscles to contract more explosively in order to produce close-to-maximum force in short intervals of time. This is something we can incorporate to bodyweight training in order to increase muscle growth. By adding a jump at the end of each rep, simple bodyweight exercises such as squats and lunges can become a lot more challenging. Fatigue, metabolic stress and recruitment of fast twitch muscle fibers – all increase leading also to an increase of muscle-growth. During high intensity anaerobic exercises such as thirty-second sprints, your legs are forced to work hard enough to come close to momentary muscle failure (when you can’t run at the same speed anymore and your form start to become worse). Once again, this fatigues the muscles and creates metabolic stress that causes your body to recruit fast-twitch muscle-fibers, resulting in muscular adaptations similar to those obtained from lifting weights. I’m not saying that plyometrics and sprints are as optimal as heavy barbell squats for stimulating hypertrophy in the lower body. But, using them strategically in your weekly routine can definitely build strong, defined and muscular legs (a lot more efficiently from basic bodyweight exercises). High-intensity running produces muscular adaptations similar to those obtained from lifting weights. Another cool bonus of this type of training is increase core activation. Just like all challenging bodyweight exercises, sprints and plyometric challenge your abs as well. 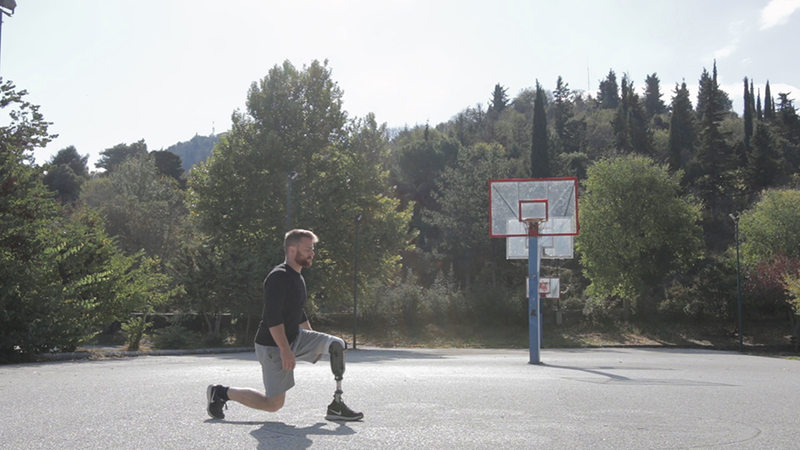 Combining Plyometrics and High intensity running with Bodyweight training is your best choice for building strong, muscular and athletic legs. So, if you're passed your newbie gains my advice is start running and jumping more! Got a question about the article? Leave a comment below!